MADISON — Growing up in the 1970s, Bruce Lee was Sal Canzonieri's inspiration for studying martial arts. But over time, just learning the moves was not good enough. For the past 30 years, Canzonieri, now 50, has researched the origins and philosophy of ancient Chinese healing arts in his free time, when he was not working as a technical writer for Bell Labs or playing guitar in his punk rock 'n' roll band, Electric Frankenstein. Since being laid off two years ago, Canzonieri has decided to share what he has learned melding various forms of kung fu, Qigong, Neigong and yoga into classes at several locales around Morris County. "I want to help people balance their energy, either emotional or physical, and help them heal themselves," Canzonieri said Sunday after a class in Madison. Canzonieri, of Hanover, said he moved to East Hanover in sixth grade and graduated from Drew University in 1982 with a bachelor's degree in behavioral science. He said he kept meeting Chinese healers who taught him the movements that allowed him to feel the energy coming from his hands. "I felt magnets coming out of my hands," he said. "Then I saw white light coming out of my hands." 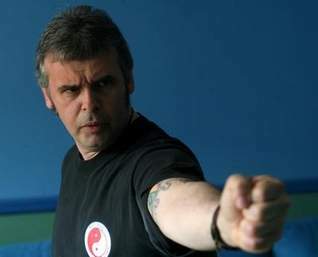 He calls his method the Jindao system, which he translates as "the way of internal energy and strength." He's offering classes in Madison on the upper floor of Sages Pages, in Denville at Health-e-Motion and in Hanover at the recreation center in town hall. Glenn Keller began learning from Canzonieri five years ago, when Canzonieri used to run a kung fu club for fellow Bell employees. Keller, 53, of Randolph, said he has practiced martial arts since he was 5 years old and continues to learn something new through Canzonieri. "It's about health and longevity," Keller said. "If you open your mind, relax and allow yourself to be receptive, at the end of class you can feel the wellness." During his Madison class, Canzonieri told his three students that the hardest part of learning Qigong is clearing one's mind. In addition to teaching specific movements, he also talked about breathing exercises, which together can help balance one's life, he said. Helen Clear, 60, of Mendham Township said she began working with Canzonieri a month ago to improve her understanding of energy, as she uses it in her Reiki practice. Susan Novick, 44, of Randolph said she had sought out Canzonieri to improve her massage therapy practice. Canzonieri said anyone at any age or level can use his program. His goal is to help people through phsyical conditioning and meditation to achieve balance in their lives, he said. "This is about mind-body awareness," he said. "It's a way of life."